'Cane & Able' - Preparations for a Biblical Crop of Runners! 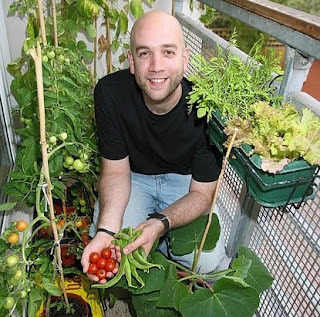 Whilst last summer's balcony efforts did not afford me the title of 'self-sufficient urban bald Hugh Fearnley-Whittingstall-type' – not by a long way – they did result in some impressive feats of urban vegetable gardening. One of the few 'runaway' successes (if you'll permit the pun) was indeed the humble runner bean – a much misunderstood and undervalued vegetable. 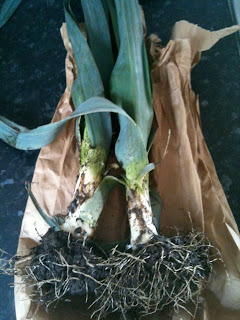 Anyway, inspired by last season's success with this hardy vegetable (click here to see 2009's balcony crop! 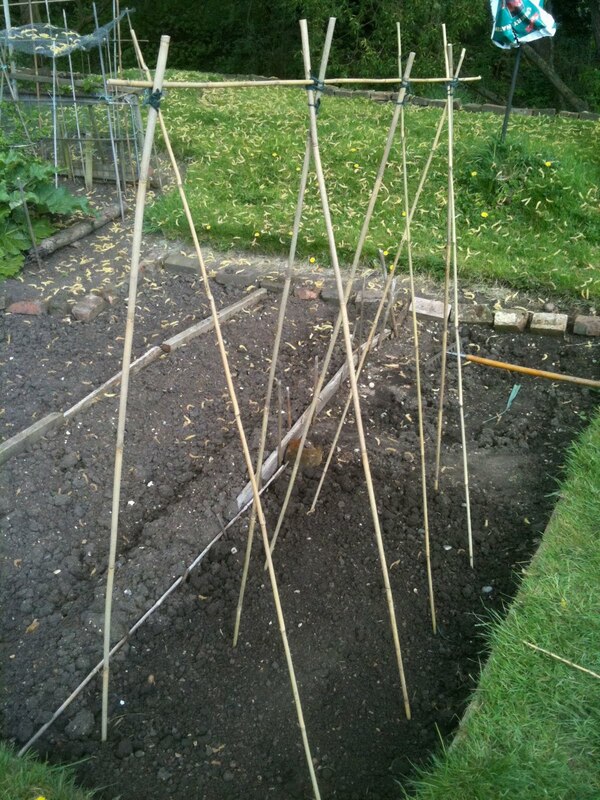 ), I had planned to set up some canes and plant some runner beans on the allotment. 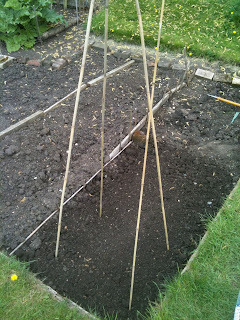 This resolution was cemented when a quick scan through this month's Gardeners' World magazine unearthed the fact that now is a great time to plant runner bean seeds directly into the soil. 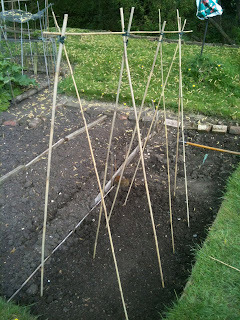 I set off to the allotment once again this Sunday, having picked up a packet of 10 x 6' canes from Robert Dyas for £4.99. Now last year, space was obviously a determining factor for me, however this year I have the opportunity to do things a little better! Whereas I had two pots with empty bottoms that sat on a grow bag last year and condensed canes, this time I intend to construct a good sized row, which will allow plenty of room for growth – and also allow air to circulate around the plants efficiently. As you can see from the pictures below, I settled on a row that was 4 canes each side, joined across the top by another cane and supported at one end by a further cane. My years watching Blue Peter as a child were evidently not wasted, as before long I had managed to knock together a decent looking and relatively rigid cane structure – voila! Now, one of the paramount basics of gardening, including vegetable gardening, is not to disturb the roots of plants when transplanting from pots to the ground. 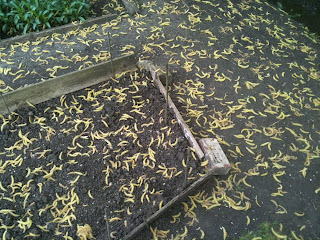 Whilst planting directly outside holds its own hazards (birds, squirrels, frost etc. ), one of the huge benefits of planting directly is that the plants will grow and establish their roots in-situ, without being disturbed at any time in their lives. 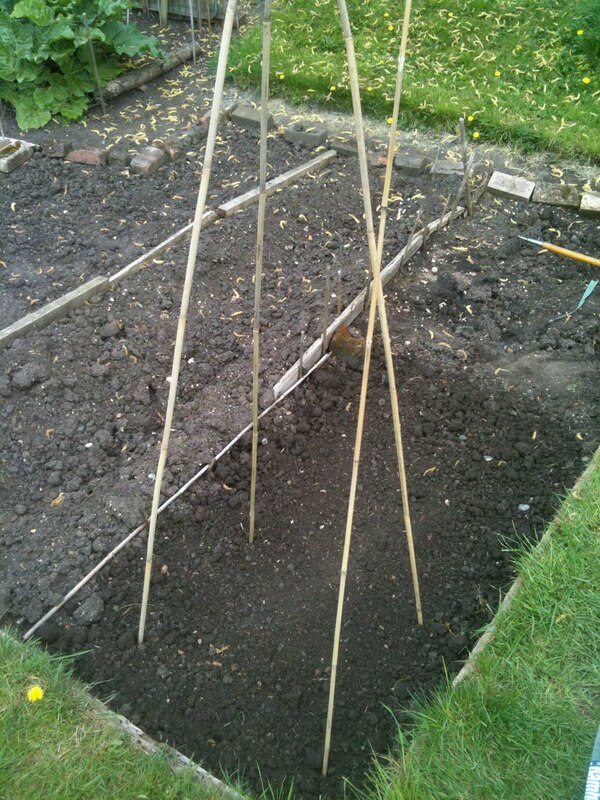 Anyway, following the recommendations of Gardeners' World, I planted 2 (and occasionally 3) seeds around the base of each pole. This method allows for one of the seeds not growing properly – you're left with a back-up – and also affords you the chance to select the strongest looking plant if both do indeed germinate. 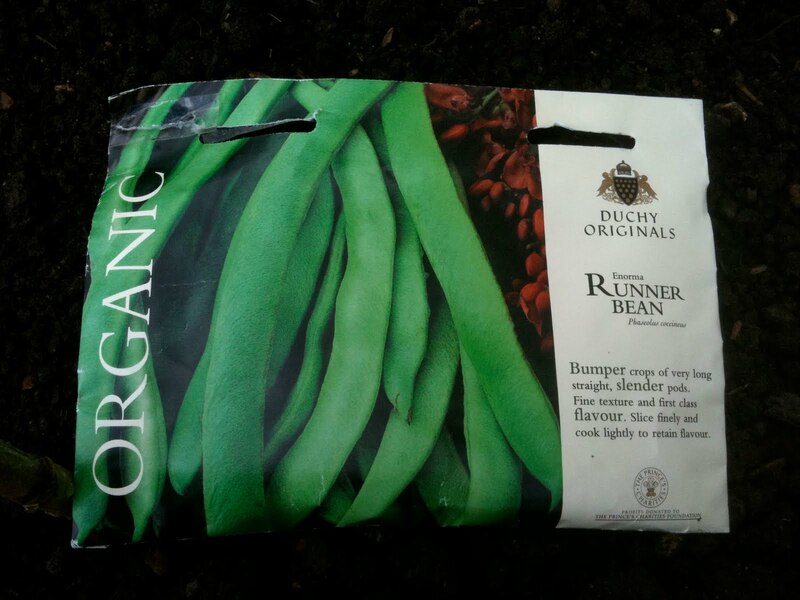 The runner beans I am using this year are organic 'Enorma' runner beans, 'Phaseolus Coccineus', from the Duchy Originals seed range. In my, albeit limited, experience, these seeds start growing very quickly, although last time they germinated under cling film on a warm windowsill in my old flat. 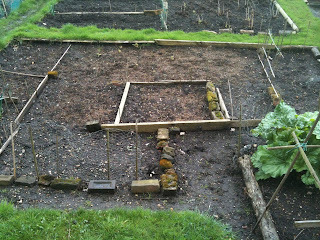 Regardless, I hope that I have some quick progress with these hardy vegetable plants – and some progress to report soon! 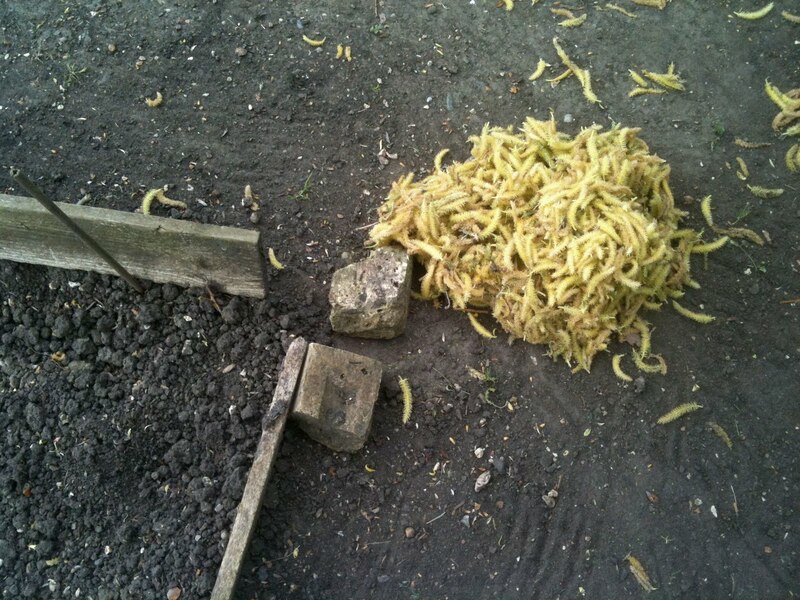 Has anyone else had any good or bad experiences with runner beans? Does my cane structure get the approval of the veteran vegetable growers amongst you? Leave your comments here, on the London Vegetable Garden Facebook page, or even at the London Gardeners' Network! 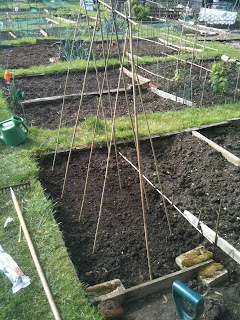 Whilst the allocation of an allotment (what fantastic alliteration so early on in this post!) 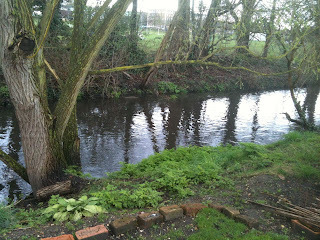 remedied one problem – that of having no space – it transpires that the Great Outdoors presents its very own set of difficulties. Incidentally, if anyone is able to identify the type of seed (and even tree) from these pictures, I'd be most grateful – and very impressed! Anyway; I digress. I set to, picking up these seeds by hand, as I didn't want to use the fine rake and risk upsetting the tiny, shallow-planted carrot seeds that have only been in the soil for a week. After a laborious 20 minutes or so, the patch was clear, although my hands were covered in more pollen than a drone of bees. Although both the patch (and my yellow hands) were easily cleared up in a matter of minutes, this example has gone to show that gardening in the Great Outdoors is a whole different ball game to pottering about on a balcony. 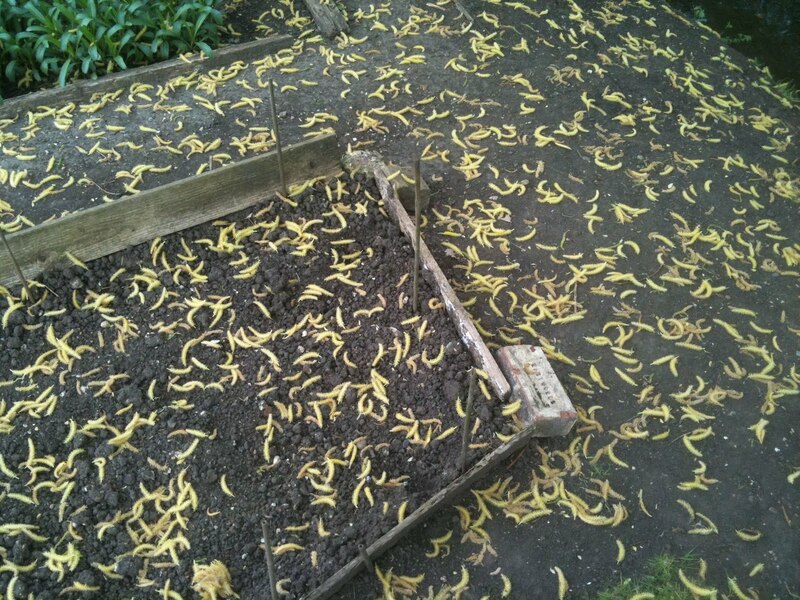 I'm thinking of investing in some sort of fine-mesh cover to put over this bed whilst the tree continues shedding its seeds, although after clearing up the patch, it seems that the soil is lumpy, crumbly and nowhere near fine enough to accommodate such tiny, fragile seeds as carrots. Am I being too precious? Are seeds designed to grow in hardy outdoor conditions like this, or should I start again using much finer soil or compost? 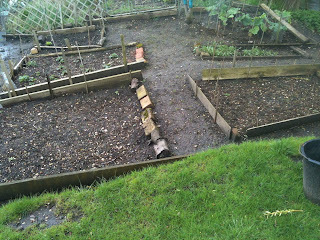 Leave a comment here - or why not write on the London Vegetable Garden's official Facebook wall? In addition to planting potatoes, Sunday's visit to the London Vegetable Garden allotment included the planting of some carrots. If you followed me last year, you'll remember that I didn't have much success with growing carrots, namely because they like to grow downwards, which is problematic when one is only growing in shallow pots! But I also learnt that you need to plant carrots thinly if you are to achieve any real success. The first variety I planted was the small, sweet 'Royal Chartenay Red' variety, which came as part of my free seed packet, courtesy of the BBC's 'Dig In' campaign. According to the packet, these sweet baby carrots will be ready to pull up in 12 weeks, which means we'll expect vegetables in July, so watch this space! The second type of carrot I planted was another early-cropping variety, 'Daucus Carota Early Nantes 2'. These can apparently be planted from late winter through to summer, so I'm hoping that they are a hardy variety for an amateur urban gardener like myself. 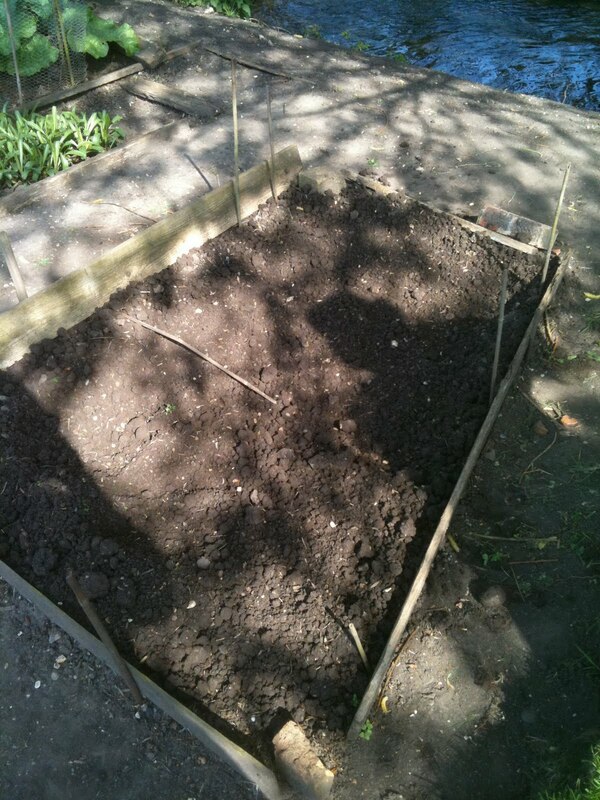 I have planted 4 small rows of carrots (2 rows of each variety) in rows approximately 1 metre long. These rows have about 12cms between each row and the carrot seeds have been planted thinly. Once the shoots start showing, I can thin these where I have been too liberal with my planting! So there we go – the second seeds are in the ground. Last year, my balcony afforded me plenty of room to grow seeds in pots on the warm balcony windowsill – a 'luxury' I can't employ this year. Nevertheless, I plan to see how I can overcome this obstacle and of course, I am now officially waiting to receive my window box garden plants from Cornwall. Watch this space! 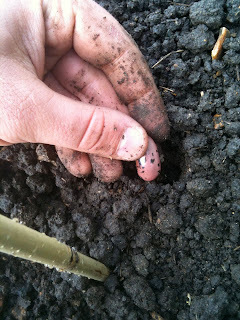 Firstly, welcome to the very first London Vegetable Garden blog post from Richmond! It's been a couple of weeks since I last posted, due to a hectic move and sporadic internet access; however I now have a few spare moments in which to update you all with gardening goings-on. This Sunday, my girlfriend and I went up to the new allotment and spent a few hours acclimatising to our new environment. The fantastic weather made this trip splendid in itself, however the amazing ham sandwiches packed by @lucaluxes topped it off, as well as coming in handy after an hour or so of digging! We have a decent patch of land, which seasoned vegetable gardeners may find rather limited, although after the confines of a balcony, it's a veritable orchard! Whilst I purchased potato growing bags, which I plan to employ for my main crop, I decided to plant my 'first earlies' in the freshly dug earth. Now, having only honed my limited gardening skills on a balcony, it goes without saying that I've never attempted to grow potatoes before. One of the benefits of being on an allotment is that you have instant access to aplenty of like-minded, knowledgeable and extremely friendly gardeners, all of whom were eager to offer advice to me. 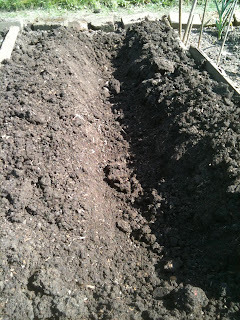 The seed potatoes are then planted in this channel, approximately 9” apart, and covered with around 5” of soil. As the plants grow, the purpose of the ridges becomes apparent, as (strangely enough) one has to cover the plants over with soil! Although this seems to contravene common logic (it's growing – it wants to come up! 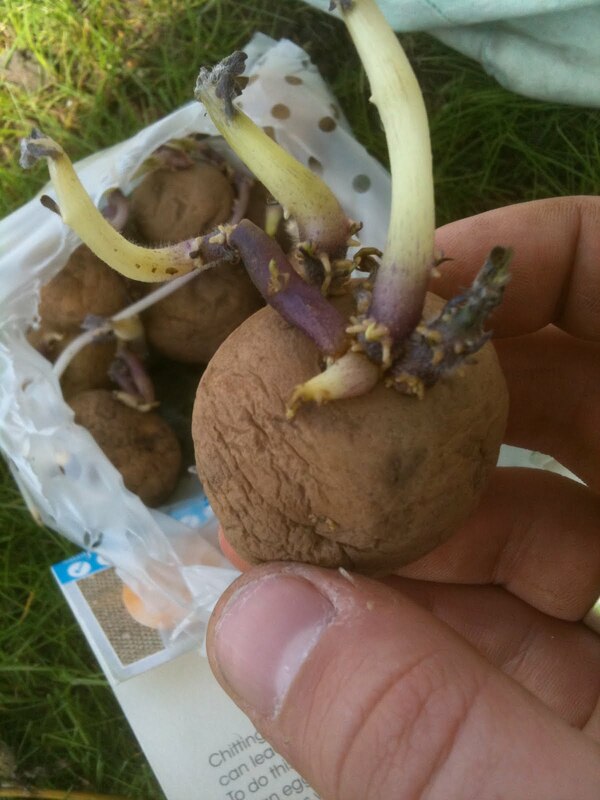 ), potato plants produce a higher yield if covered in more soil – it encourages more growth and helps the forming potatoes to grow more effectively. So there we have it – the first vegetables of my first ever allotment are in! This event was made even more exciting by the fact that I am attempting to grow potatoes, which is completely new to me. They are due to crop around June or July, so we'll wait and see what happens. 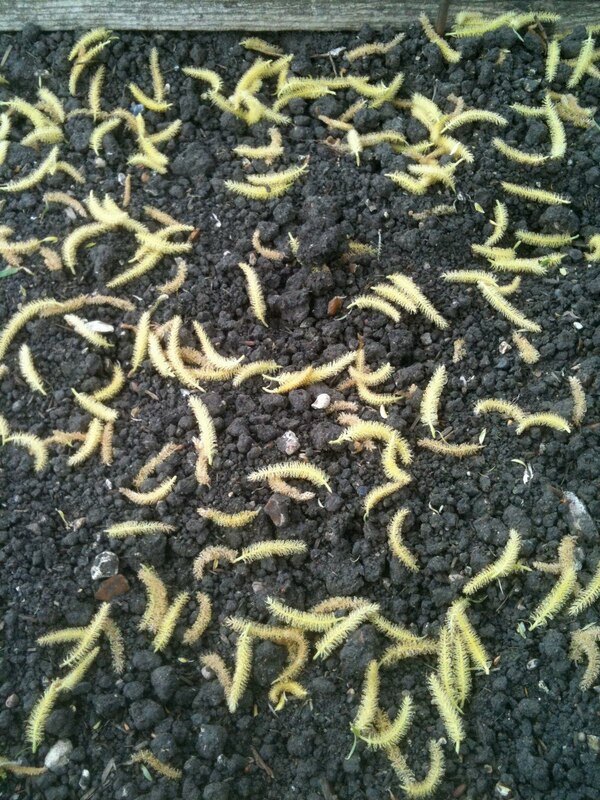 As soon as shoots appear, we'll get it on the London Vegetable Garden blog! A Poignant Pause for Reflection. Grow Potatoes with the London Vegetable Garden! Forgive the frequency with which these blog posts are coming; however I'm keen to rattle off a few before a weekend that will be spent moving, sorting out a million different things and waiting for internet access! Anyway, as promised, here's the very first vegetable venture of 2010 – and it's one that any of you with a balcony, patio or generous doorstep can join me in as well. When I knew that I'd be growing vegetables on an allotment this summer, my thoughts initially turned to new possibilities, of which the humble potato was one! The potato is a tuberous crop, which means that the actual potato is an edible 'tuber' which supports the potato plant by storing nutrients. Following rice, wheat and maize, potatoes are the world's fourth-largest food crop, meaning the plants I'm attempting to grow this summer really will be the 'staple' of the London Vegetable Garden allotment. Now, rather ironically considering that I now have an allotment in which to play (you can take the man away from the balcony, but not the balcony from the man...), I'll be planting my potatoes in these dedicated potato-growing bags, which are designed for small spaces such as balconies and patios – perfect for urban vegetable gardeners with minimal space. These can be purchased online and in all good gardening shops relatively cheaply; I purchased these three bags from eBay for £6.99 (plus £2.99 delivery), so they're easy to get hold of. Now, if you have a tiny balcony or patio, there's no reason at all why you can't go out, buy some of these bags and have a go just like me! If anything, a balcony or doorstep affords a degree of shelter, whereas my potatoes will be well and truly out in the open, but hopefully the results will be exactly the same. 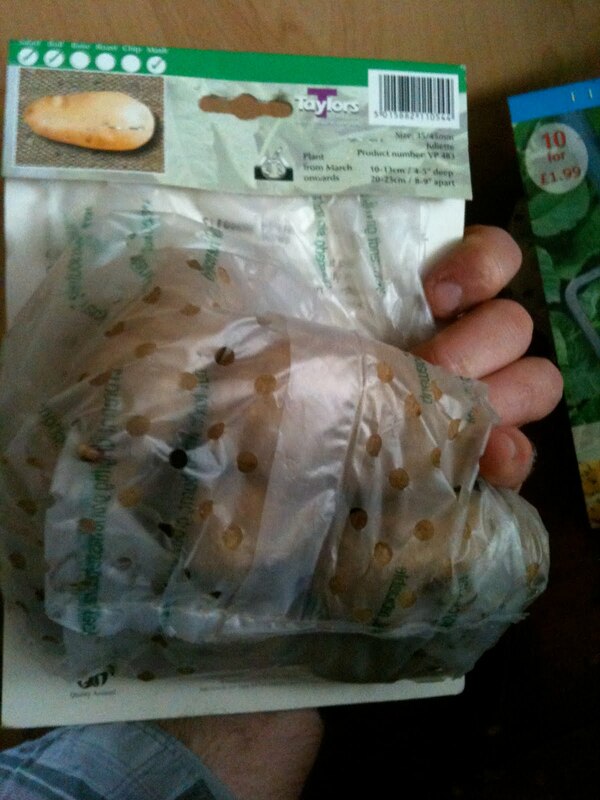 The only other thing you'll require to have a go at growing your own potatoes (aside from compost and soil!) are some seed potatoes! Now, I have bought two packets – one 'first early' variety, 'Rocket', which should crop in early summer, and a 'main crop', 'Juliette', which crops in late summer. By sowing a 'first crop' and a 'main crop', you're hopefully guaranteed a steady supply of potatoes throughout the summer as opposed to a huge harvest condensed into a short timeframe! I shall also revisit this cost come the autumn and see just how much I have saved, providing I actually manage to grow some potatoes... it'll either be an incredible cost-saving venture or an exercise in growing the UK's most expensive potatoes! I shall soon be 'chitting' these potatoes, which involves exposing the seed potatoes to light in order for them to sprout shoots and take better when planted. Needless to say, I'm waiting until I'm in the new house on Friday before setting these potato seeds up and getting started properly, which of course, will all be recorded here at the London Vegetable Garden for your perusing pleasure! Until then, why not think about growing potatoes on your balcony? Chris, over at Elevated Agriculture, is also having an attempt on his balcony, using similar grow bags, so there really is nothing to stop you having a go. Good luck – I hope you'll all give it some thought! And remember, check back next week for some updates and further advice! River Cottage? Try Rocket Gardens! 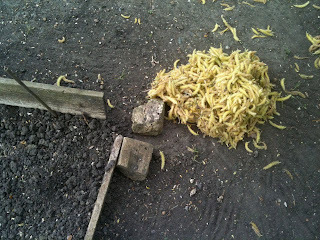 Whilst the excitement caused by Saturday's allotment visit has not yet abated, reality has certainly started to kick in. Along with packing copious boxes ready for the impending move, all the energy of recent weeks has been spent looking for land, rather than thinking about what to put into it! Now that the London Vegetable Garden has secured a new home and the move is but a few days away, it's time to start thinking seriously about what to start planting – and how to go about this. Although the quantity of balcony produce produced last year could hardly label me 'self-sufficient', I took great pride in growing all of my crops in pots from seeds. A good sized balcony and a huge windowsill afforded me a makeshift 'greenhouse', which enabled me to nurture seedlings until they were strong enough to endure the climes of life on the London Vegetable Garden balcony! 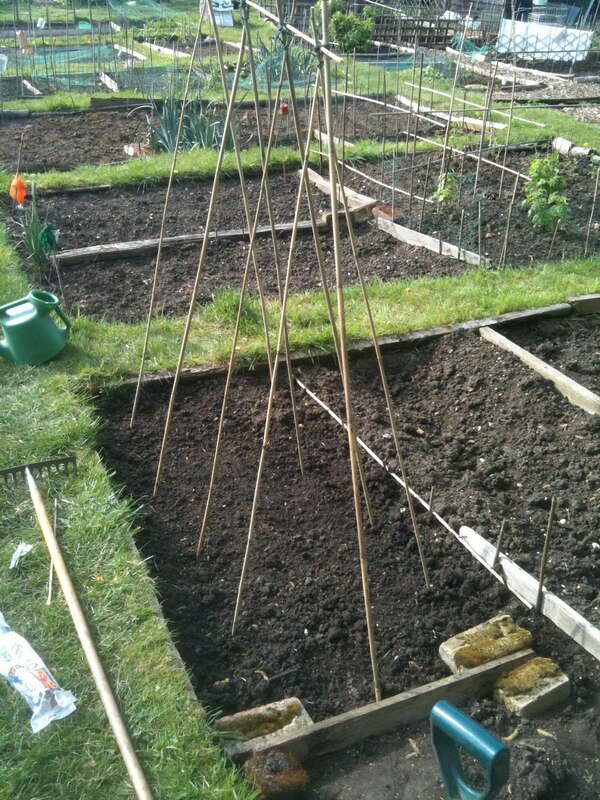 Now this year, I may have a share in an allotment, but this does not mean that problems no longer exist! My new flat has no real 'growing area' in which to grow seedlings on the scale that I managed to last year. Whilst I will be starting off this year's tomato plants (and a few other vegetables) from seed on a windowsill or two, the majority of this year's plants are going to be planted in situ in the ground. Whilst this avoids root damage and disturbing young plants when transplanting seedlings between flower pots, it also means that one cold snap can prove much more of an obstacle to young plants. Although it's now British Summer Time, the weather this Bank Holiday weekend has shown that BST tends to exist mainly in name only! One solution is to bring in baby plants and transplant these into the ground. Along with a National Trust book on allotments, my mother has kindly posted me my very own window box garden! Now obviously she hasn't send me a 'real' garden (I'd have soil all over my doorstep and letterbox! 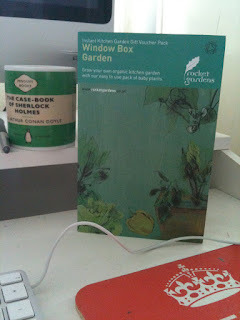 ), but she has sent me a card that, once sent off, ensures I'll be delivered fresh vegetable plants to use in my allotment. Now, I shall still be attempting to see what I can grow from seed in the new flat (the trials and tribulations of which will naturally be chronicled on the blog), however these baby plants will enable me to get stuck right in once I officially arrive at the allotment. The card states that my plants will be delivered in around 10 days from receipt of the card, so once I'm moved and set up at the allotment, this will be one of my first tasks – watch this space! 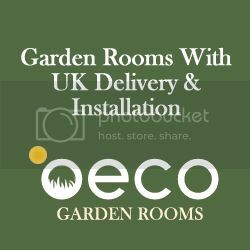 If any of you have used a similar 'plant delivery' service, I'd like to hear from you! 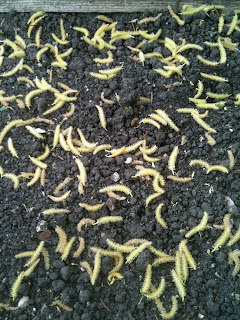 Simply leave your comments on this post, or write on the London Vegetable Garden's Facebook page! If you're not one of the London Vegetable Garden's more regular readers, a perusal of previous posts will inform you that my better half and I will imminently be moving to pastures new – pastures, if you'll permit the allegory, that do not come with a balcony. But fear not, dear reader! Delve deeper into posts and you'll also be informed that after much campaigning, I have kindly been handed half of an allotment in order to continue my organic odyssey and keep the London Vegetable Garden running! So this morning, I rose early and made the trek from Hackney to south-west London (no mean feat considering that the UK's planes, trains and automobiles are all on strike / undergoing engineering works / old and decrepit) to meet with the two ladies that had kindly answered my gardening SOS. A gloomy, drizzling day met me (it's Bank Holiday Britain – sunshine is outlawed) and I made my way to my new horticultural home. The two ladies met me at the gates and walked me down the allotments to their plots, half of one which has been kindly given to me! After quite a while discussing gardening, the whole London Vegetable Garden project and my imminent move to Richmond, I managed to whip out my phone and take a few snaps for readers of the blog. 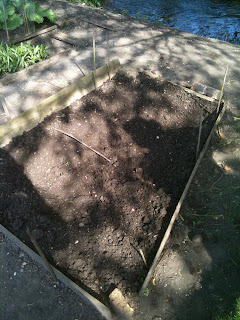 So here we go – this is the new, revamped London Vegetable Garden 2010! This area is approximately 4m x 3m (give or take), which in all honesty, is more than I ever thought this allotment share would provide. In addition to this, the following 2 raised beds are also for my use, which measure approximately 1m x 1m each. 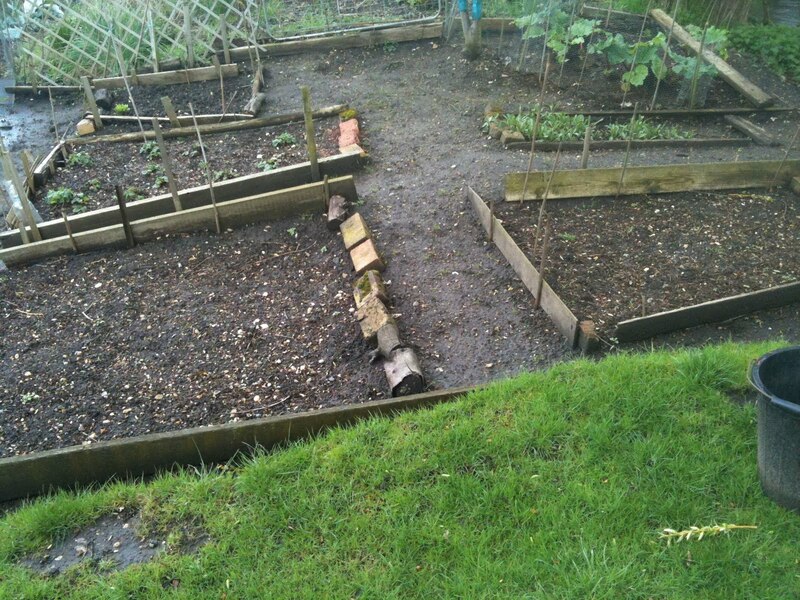 So there we have it – the London Vegetable Garden 2010! I now have the complicated (yet thoroughly enjoyable!) task of planning what I'm going to grow and where! Not only does this 'real' piece of land (I still can't quite believe it!) offer me the opportunity to apply my learnings from the balcony, but it also affords me the chance to attempt things that really were unfeasible on a balcony, such as plants requiring deep ground and lots of space – step forward potatoes, leeks, courgettes et al! 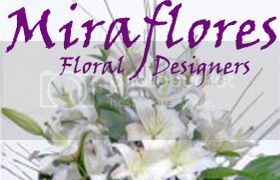 i) A lively blog from a gardener who's no longer an amateur, but by no means authoritative. I want to share my experiences as I go along and learn from a community of like-minded people – you. ii) A real delve into gardening issues in London. We live in one of the world's greatest cities, yet the bureaucracy surrounding allotments (40-year waiting lists??!!) and community gardening needs to be addressed – I aim to highlight these issues and campaign for action with your support. iii) An entertaining read! I love writing this blog, so hearing from people who enjoy it really is the icing on the cake. I hope that over the coming year, you'll all continue to share in my successes, help me when I have problems and console me when things don't quite work out! So there we have it – the start of a very exciting new adventure. Stick with the London Vegetable Garden and I'll attempt to inform, entertain and hopefully educate – this really is a project driven by the people who support it, from the kind ladies that have given up part of their allotment to the readers who email me tips advice and their own experiences. Here we go – exciting times ahead! 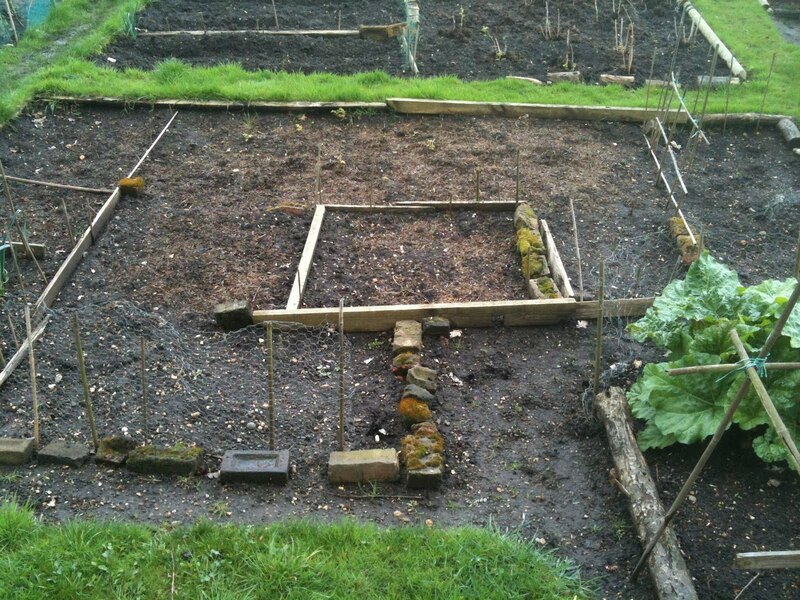 Want to follow the London Vegetable Garden this year?